All Freedom FC coaches have at least a USSF E license. All our coaches are encouraged to continue their education through USSF and NSCAA. Curt was DOC of Stampede from 2003-2008 Stampede Soccer Club and was very instrumental in the devolvement of the club. When joining Stampede in 2003 the club had 8 teams. When he left, there were 28 teams. Curt created programs to promote youth soccer development including Mini Stampede which several quality players came through. In 2006, he won a State Cup title with his B-13 team. 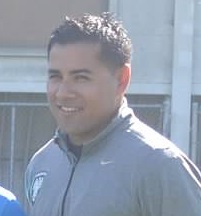 In 2008, Curt created Freedom FC with one G-12 silver team. Five years later, Freedom FC has grown to a 30+ teams in the Club. Curt also took the first G-12 team from Silver to Premier level. Curt started playing soccer at the age of 5 and was a natural. He began his club career at the age of 9. He won several tournaments, including a State title at U-16. He was a four-year Varsity starter in High School and two time captain. At 17, he made Team USA’s U-18 team and was heading for Europe to play for 3 months. Unfortunately, while playing his senior year in high school, suffered a career ending back injury. Curt has been married for 20 years and has two sons. His wife, Rei-na, is his biggest supporter. Their two boys have followed in his footsteps playing the game. Their oldest son, Gage, is a tremendous player and has won a youth state title and collegiate state title. Their youngest son, Garrett, is an amazing player and plays for Freedom FC on the U-14 Premier team. There are two places Curt would want to be…at the lake with his family or on the pitch! Kugler is one of the original coaches and co-organized the club’s first U11 boys team club with club president, Curt Jensen, in 2007. This team continues today as a Flight 1 – 1998 team. He also started and trained the 2002 Blue team for 3 years, which is also a Flight 1 – 2002 team in the SCDSL. Kugler’s current team, 2002 Green is playing the 2016 season in Flight 1 – Europa North. Kugler has coached at all age levels, but truly enjoys developing younger teams for the club by stressing a commitment for playing soccer with passion and good sportsmanship. Larry Dube grew up in South Africa where playing soccer came second nature to him. As a professional player, his career spanned over 16 years and traversed 3 continents. He began playing with the Dynamos of South Africa before signing with Bundesliga 2 Team Vfb-Lubic of Germany. Next it was on to Holland to play for the Dutch outfit NEC-75. Then a nostalgic move back to South Africa to play one more season for his former side, the Dynamos, before heading to the United States. Once in the U.S., Larry quickly made a name for himself playing in the World Indoor Soccer League for the Arizona Thunder before the league folded. The league eventually saw a resurrection in the form of the Major Indoor Soccer League and the famed South African soccer player donned his cleats for the illustrious Dallas Sidekicks. After leaving professional soccer as a player, Larry turned his immense soccer knowledge and skill set to the ranks of coaching youth soccer. He has quickly become one of the most respected coaches in the Southern California club soccer circuit, having developed a reputation for putting together championship caliber sides. More importantly, his ability to develop players is validated by the growing number of players he has been able to place in the collegiate and professional ranks. Coach MIke is a native of Chino Hills and went to Canyon Jr. High and Ayala High School. Mike started with Chino Hills AYSO, played College in Arizona and started his professional career at Portland Timbers. From there he signed with LA Galaxy and after his years as a professional, he is dedicating his life in the development and mentorship of kids. * Senior club appearances and goals counted for the domestic league only and correct as of August 31, 2015.